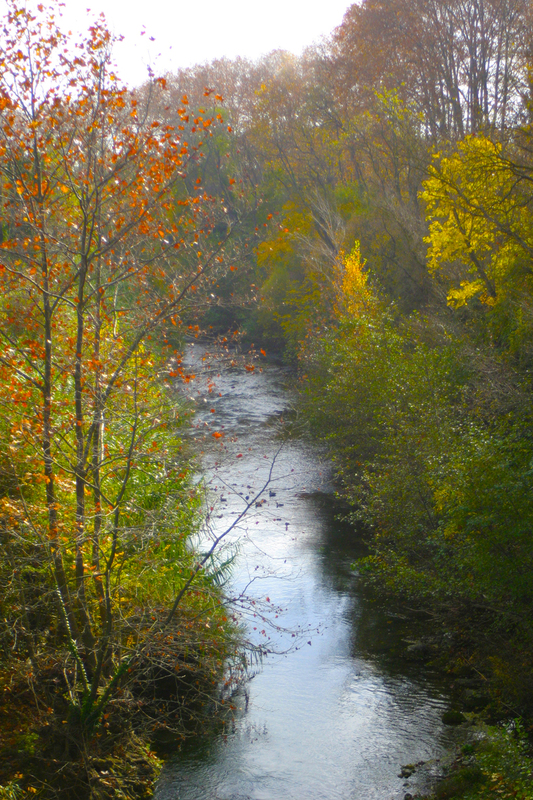 Life in the tiny Languedoc village of Mirepeisset is anything but action packed. Perhaps it is because half its population is of Spanish origin (having arrived here a few generations ago as migrant grape pickers) that its inhabitants have adopted the Spanish manana manana way of life. Surely, if something can be postponed till tomorrow, why in goodness’ name would you do it today? Unless of course, it has something to do with the vendange. For when the news breaks that the grapes are just exactly ripe for harvest, everyone knows his and her role. They will work through the night and if necessary, continue the next day, without sleep and without batting an eyelid, until the grapes are in. For weeks they have been waiting for this moment, and for weeks they have been ready: cleaning and re-cleaning the gleaming crushers, rinsing out the fermentation tanks, hosing down the floors, pumping the tires of the trailers.. all so when the right moment comes, everyone can jump into action. The post office, bakery shop and streets hum with anticipation and excited chatter. All those involved in the wine making business are afflicted with the same passion. And that includes all those that are not involved. And why wouldn’t it? Doesn’t everyone benefit from this industry-sent-from-heaven? Grannies eagerly offer to baby-sit when young mothers are called in to help with the harvest; everyone takes turns in providing a sustaining déjeuner for the hardworking harvesters, and everything, but really everything is left until the grapes are safely brought in. It is perhaps also due to the Spanish influence that the village is called Mirepeisset as this means ‘a place where one sees fish’ in a mixture of local patois and Spanish. Not an strange name for a place where the river Cesse, the Canal du Midi, a small feeder canal called La Rigole and a lake called La Garenne converge.. Directly behind my house, the Cesse also has a secret: tucked away among the trees and invisible from the road, is a pebble beach with clear running water that is deep enough in places for swimming and even diving from the rocks. A little further along there is La Garenne – a popular place for families to picnic and to swim an afternoon away. 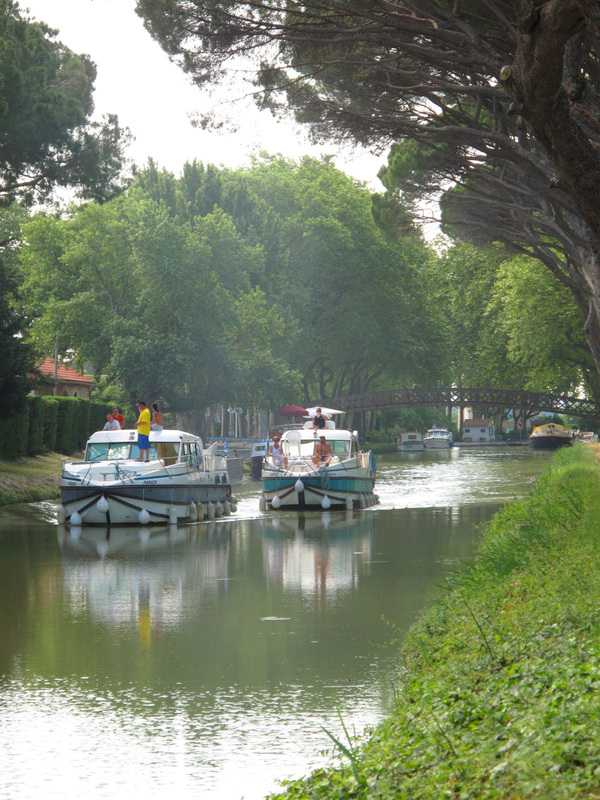 And while in summer the Canal du Midi is thronged with barges and pleasure boats, its adjoining tow paths allow no cars, making walking and cycling safe, peaceful and comfortable. 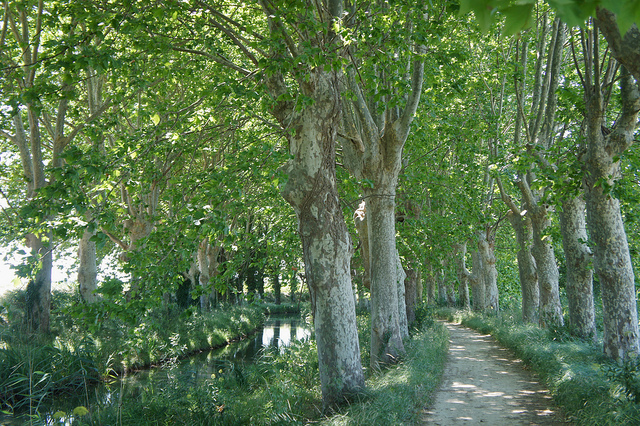 Temperatures can rise to between 35’C and 38’C in the height of summer, and the tall plane trees, planted almost along the entire length of the Canal du Midi, interrupted only by ancient stone bridges and old, still active locks, are not only pretty, they provide the so-badly needed shade. It goes without saying that from Toulouse to the Mediterranean port of Agde, the Canal offers an uncountable reasons to stop for a picnic, a lazy lunch, a pre-dinner drink or a full-blown dinner somewhere beside the water. But I digress. 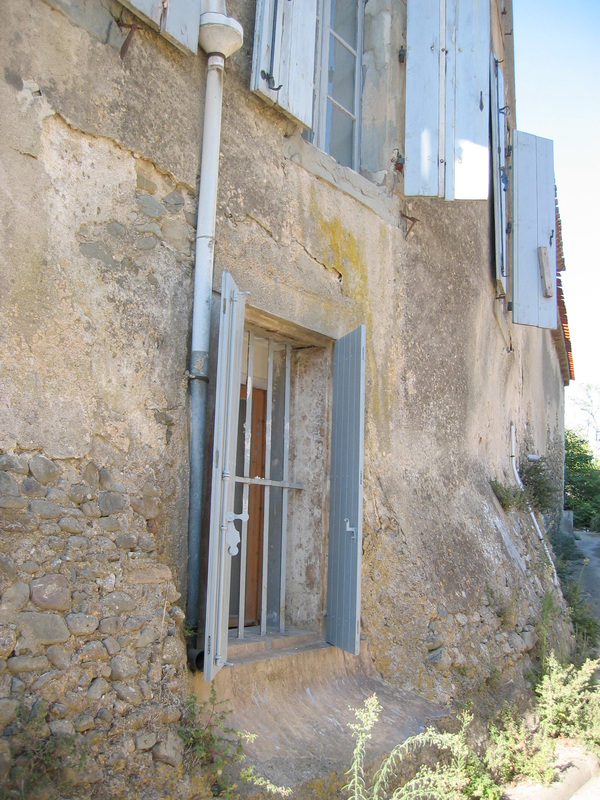 I am here to restore my recently bought Maison de Maître near Narbonne. It has taken a few weeks to get organised but frustrated stories trying to cope with the French système and attempting to fight a way through the maze of Gallic officialdom and bureaucracy have all proven to be false alarms. Opening a bank account, installing a telephone line, subscribing to the internet – all with standing orders (or prélèvements automatiques) in place – were executed without a hitch, in as little as one week. (I remember applying for a telephone line in Ireland back in the 1980s – it took nearly a year to be connected!) Here, in my house, where there was no previous telephone line, it took six days. Even unlimited broadband was on offer in this tiny, remote village – and for a reasonable €24 a month. Arranging insurance for the house and its contents, buying a car (a delightful 18-year-old jalopy), as well as organising its insurance and NCT proved no hassle. But it was the job of choosing and installing my own letter box three weeks after my arrival, that finally forged the realisation that I am now part of this delightful community. All those I have met and dealt with could not have been more helpful. And welcoming. And honest. And generous. When something went wrong with my car soon after purchase, its previous owners were so horrified and embarrassed that they insisted on paying for the repairs. Whilst many recent immigrants look upon the settling-in period as a series of chores and frustrations, I have enjoyed every minute of the experience. But let me get back to the house . . . I have spent a few weeks picking anyone and everyone’s brain for information on how to go about finding craftsmen that a) know their boulot and b) will not take advantage of ignorant foreigners in order to make a quick buck. Again, I need not have worried. The French are very upfront about it all. You simply explain what you need to have done and the professional will provide you with a devis (or estimate) for the work you want carried out. Obviously, several devis make it easier to make an informed choice. Thus, the first weeks were spent interviewing potential maçons (builders), plombiers and electriciens. Whatever money is available, choices have to be made. The leaking roof is obviously a priority, whilst the giant roof terrace, though extremely desirable, is not. The dodgy attic floor and cracked walls, due to sagging lintels over the old windows on the second floor, also need urgent attention, as is the re-positioning of one rotten poutre (beam) that seems to support the entire roof. There are other difficult decisions to be made – should I replace the beautifully crafted but delicate original windows (with their intricate details and 200-year-old ultra-thin glass panes) with new double-glazed, coarser modern counterparts? Or should I just put on an extra cardigan (or three) and put up with the howling winter winds? I dream of perfect harmony between old and new, in a style that is decidedly modern minimalist. But this will involve erasing the meticulously executed marble and sandstone trompe l’oeil paintwork in the corridors and staircases throughout – an ancient craft, now lost, that required the plâtrier-peintre to plaster the walls with hot irons in order to render the surfaces smooth as lacquer, ready to be applied whilst still wet, with their artistic designs, fresco-style. But I’m not going to think about finances tonight, for tonight feels special . . . Although two of the four floors in the house are habitable (meaning that I can enter the rooms without risk of personal injury) I am still camping out on one floor: the rez de chaussée (the ground-floor – one up over the basement). The floor, for the moment, provides me with all I need: a huge unfitted kitchen with large double doors that lead to an even larger dining/livingroom. 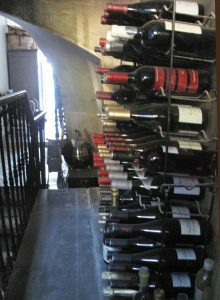 Off this is a secret larder with a hidden but exquisite wrought-iron-and-stone balcony (perfect as wine cellar-to-be!) 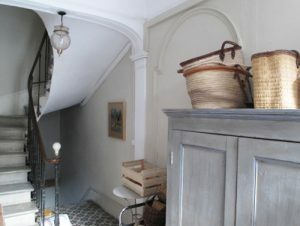 which in turn leads back to the hall with its ancient and beautiful staircase to both up- and downstairs. There’s also a smallish bedroom and a bathroom on this floor. Despite (or perhaps because) the main rooms are so sparsely furnished, the atmosphere is simple and serene – especially tonight, with the beautiful plasterwork lit up by soft candlelight that trembles in glass vases in the tall elegant windows. I have settled on my choice of builder. 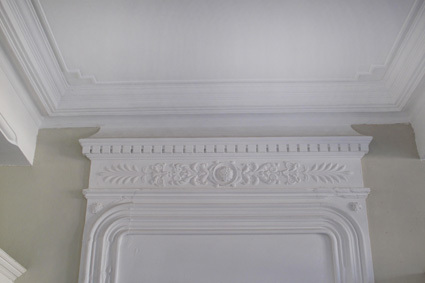 A serious and professional guy who appears to be the only one (out of some half a dozen interviewed) who seems to understand that I want to restore rather than rebuild the house – meaning that I want to keep the beautiful plaster cornices, the delicate windows and those stunning terre-cuite tiles that now cover the attic and basement floors. Plumbers, however, are hard to nail down to do major work. But they will drop tools and attend immediately to an emergency. So when the existing bathroom presented serious problems of a hygienic nature I had the opportunity to call on two plumbers. First there was Monsieur P, who had been working on a neighbour’s house when my emergency erupted and offered immediate help.The man was a little dote. I say little, because the top of his head just about reaches my shoulder. But he takes serious pride in his profession. His first task had been an unpleasant one, one that he nevertheless plunged into with great relish. My only reservation was that he had insisted on shaking hands afterwards . . . But in France, like elsewhere, plumbers earn high wages and can afford to go on holiday frequently. When it appeared a few days later that the drains were still blocked, Mr P was on holiday. Enter plumber number two: Serge Grottin – a fortunate man, since if his name had started with a C instead of a G it would have meant ‘turd’. Serge too appeared as soon as I explained my problem and he did sort out the problem, though rather drastically: he got rid of the blockages but at the same time removed all the waste pipes which now had to be replaced. Trying to nail either Mr P or Serge down to installing two new bathrooms, proved altogether impossible. Until… I mentioned Ireland and Dublin. 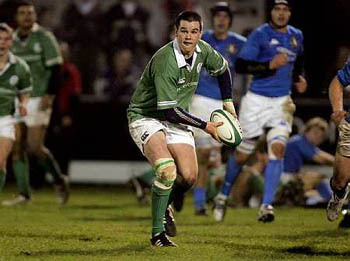 “If only I could get him some rugby tickets for a France-Ireland match… perhaps he would be able to fit in the work after all…” Frantic phone calls between Dublin and Mirepeisset ensued and concluded somewhat hopefully. And thus my two bathrooms were installed – quickly and professionally. I have left Serge’s pencil drawing of Lansdowne Road Rugby stadium on the bathroom wall, complete with arrow pointing to the place from where he would like to watch the match. Meanwhile in the village of Mirepeisset the days pass in gentle contentment. Like all French villages, the Mairie takes care of the day-to-day running of a village or town. For instance, it deals instantly with anything from car registrations and sewerage to local water supply and road surfaces. There’s no waiting and no queuing – problems are dealt with on the spot. As there are no robberies in Mirepeisset, no drug-related problems nor vandalism, the mayor can devote all his time to dealing with matters that make life more pleasant for everyone – and that includes the elderly and the very young. Since there is no litter either (everyone uses the communal bins provided), village funds go directly towards the efficient running of a recycling plant. Every Thursday the village pick-up truck will collect whatever is placed on your doorstep: plastics, clothing or papers or old televisions – all to be deposited in its individual containers in the decheterie. And so each day has its purpose. 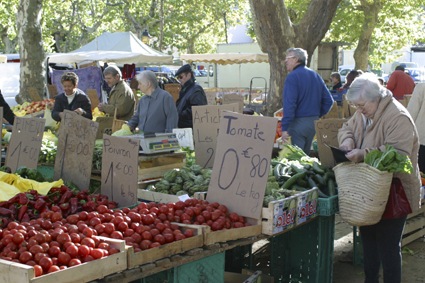 One thing which Mirepeisset regrettably does not boast, is a weekly open air food market. There just aren’t enough people in the village to support it. Those that own a car, visit the markets in surrounding villages or do their shopping in supermarkets. But for those that do not possess wheels, there’s an alternative system in place… At around 10am on a Thursday the loudspeaker on the Mirepeisset Mairie sends out a scratchy message that the travelling volailler (poultry-vendor) and the jardinier with his veggies and fruit are installed on the square. They stay there for an hour. Fridays sees the arrival of the poissonnier (fishmonger) and the butcher, whilst on Saturday the Mirepeissetians look forward to the patissier. And for those who like to eat the flesh of the noblest of animals, the chevalier visits on Mondays. Minutes after the public announcement the housewives of Mirepeisset are queuing, panniers in arm, to purchase today’s dinner. Despite not doing much business even the chevalier sticks to a schedule that apparently has not changed since 1930s. But then life hasn’t changed here either. If it was in black and white, it could be taken for a day in the 1950s world of Fernandel. In the middle of the village is a small square, aptly named La Placette. 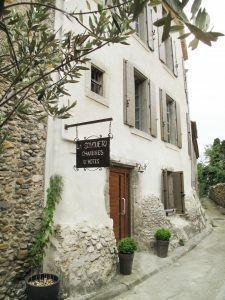 There is one little shop that sells anything from fresh baguettes, newspapers and wine to charcuterie and safety pins. It also offers a fax and photocopy as well as a dry cleaning service. It is the hub of the village. 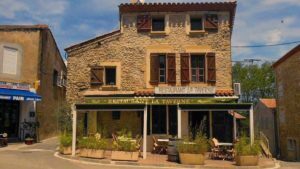 Between it and the luterie (the small workshop of the highly respected violin and cello maker Bernard Ponti) is a little gourmet restaurant (La Taverna) with an outdoor terrace that is surrounded by potted plants for privacy. And in front of this are two benches, which adhere to strict rules as to their timing and use. 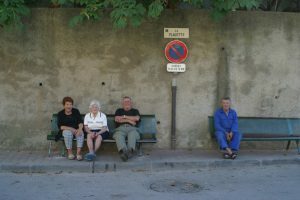 In the morning the seats are reserved for the aged – this may be mixed company (ie retired ladies are welcome to mix with the men at this time). Lunchtime is too hot in the summer and most people stick to their shaded houses for coolness and rest. 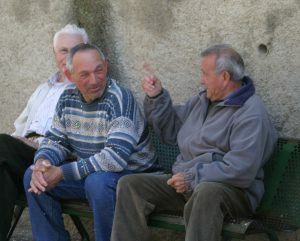 By 4pm the women of the village are allowed exclusive privilege of les bancs – all ages congregate for the serious business of catching up on local gossip. But when the time comes for the ladies to move indoors to prepare dinner, the men come out in droves to take their place on the benches. They’ll sit there all night, if it weren’t for their wives ordering them in for the evening meal. Some men will return to les bancs after dinner to continue the important discussion on the new traffic sign that has just been erected in the square (two hours of animated chatter), or the advantages of a van over a saloon car (three hours of hot debate), or indeed whether it’s going to be a better year for white than for red wine (at least four hours of serious discussion). Even at the age of 84, toothless and wrinkled, these men flirt with women and life in general. It is wonderful. And invigorating. This is how life should be lived. They haven’t much and are content with little. But by golly, they know how to make the best of it.